The new NGRM700 multi-purpose device from Bender UK provides continuous monitoring of the neutral grounding resistance (NGR) and fault currents in high resistance grounded systems for mining and minerals operations. It incorporates measuring technology that is sensitive to both AC and DC current. This means for the first time a single monitor can detect both DC fault currents and residual currents in the harmonic range. The NGRM700 provides a more comprehensive overview of the power supply status for plant operation, improving overall efficiency, identifying developing faults earlier and reducing plant downtime. The use of power converters continues to grow as businesses seek to generate and use energy more efficiently. These converters can cause residual currents, which cannot be easily detected with conventional monitoring solutions. The new NGRM700 monitors the integrity of the neutral grounding resistor and uses passive and active measurement methods for enhanced accuracy. Combining the device with a residual current monitoring system multi-channel relay allows for automatic branch fault location and shutdown. The comprehensive database produced through continuous monitoring also reduces the scope and cost of regularly scheduled test cycles. 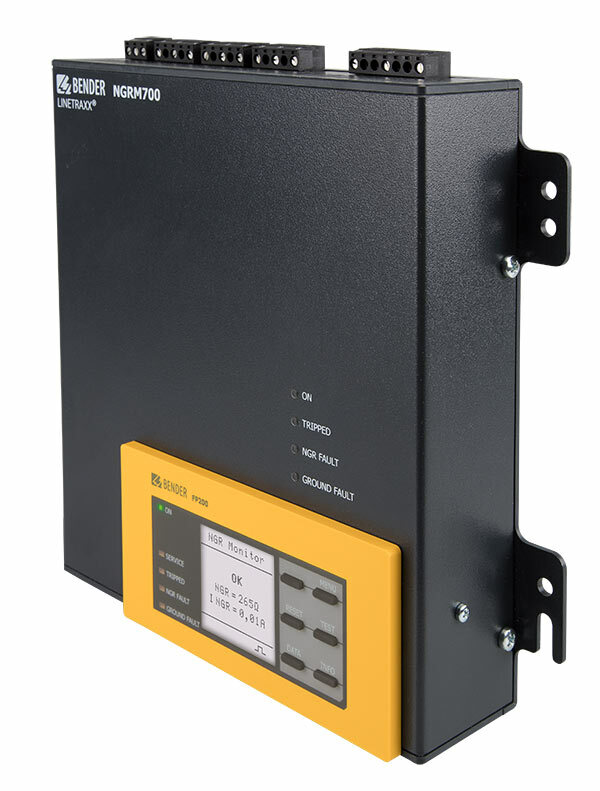 Advanced features of the NGRM700 include a digital display showing all measured values in real time, online and offline NGR integrity monitoring, indication of faulted phase and a pulser for manual ground fault location. The integrated HMI is detachable for panel door mounting. A built-in web server and Modbus/TCP support allows values to be read on-demand across industrial Ethernet networks and integrated directly into an existing data management or SCADA-system. Limit values can be set to meet customer-specific requirements and regional standards. All settings and information can be arranged within parameters and read both directly on the device and via the integrated web server. An integrated phase motor shows the phase in which an earth fault has occurred, making it easier to troubleshoot and identify its location, particularly in extensive plants. The NGRM700 is designed for use under harsh environmental conditions at altitudes up to 5000 metres above mean sea level and extreme temperatures. Bender has proven expertise in designing and manufacturing innovative electrical safety and resilience products to improve asset availability and enable predictive and preventive maintenance in the most demanding and arduous environments. A pioneer in the design and manufacture of electrical safety technology, Bender traces its origins back more than 70 years to safety monitors for mining installations in Germany. Company founder Walther Bender patented the first insulation monitor to forewarn developing causes of electrical failure in mining applications - detecting potential loss of power to vital underground services. Today Bender is a trusted partner to mining and minerals companies worldwide, providing electrical safety solutions and a range of high performance products that includes insulation and residual current monitors, ground fault detectors for ungrounded AC and DC systems and for solidly grounded and high-resistance grounded AC and DC systems, earth fault detection systems and power quality meters. The integrity of production power systems is vital when maintaining the operability of equipment including crushers, conveyors, hoists & cranes, pumps, fans & compressors , generators, lighting circuits, motors, variable frequency drives (VFDs) and other critical hard-working systems. Bender solutions monitor and detect faults in systems offline and online across the entire electrical infrastructure. Bender UK’s skilled and experienced team of technicians and engineers are available 24/7 delivering service, commissioning and technical support to demanding industry applications which cannot afford to lose power.